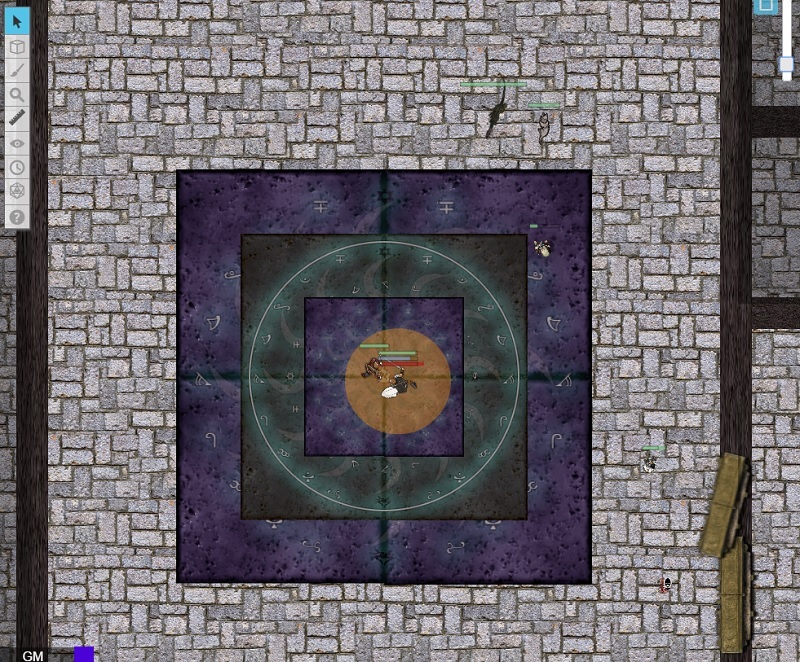 We seem to be doing rather well at having set piece battles, and this week was no exception – somehow it worked out that this battle took the entire session too, which I was not expecting. It just goes to show that even with most of their magic and healing expended, that the adventurers are able to dig deep. We’d left them beginning to climb the magical ziggurat on top of which was one of the Emerald Claw commanders, a mummy sorcerer. The more ordinary mummy cleric encountered on the air ship in the last chapter had proved a tough opponent, and this one was raining spell upon spell upon the adventurers. As he was protected by a globe of invulnerability generated by the ziggurat itself, they weren’t able to return fire, and so more traditional means needed to be employed until they could get inside his perimeter. Kurtis learned from his tendency to not climb walls successfully to begin employing a grappling iron, which suddenly made his life a lot easier than his previous attempts at parkour. Ruin, shapeshifted into his favoured velociraptor-like form made his way up in leaps and bounds. Bumperklart started mantling his way up, and Theo found his way blocked by the suddenly reanimated bodies of the guards killed last session. 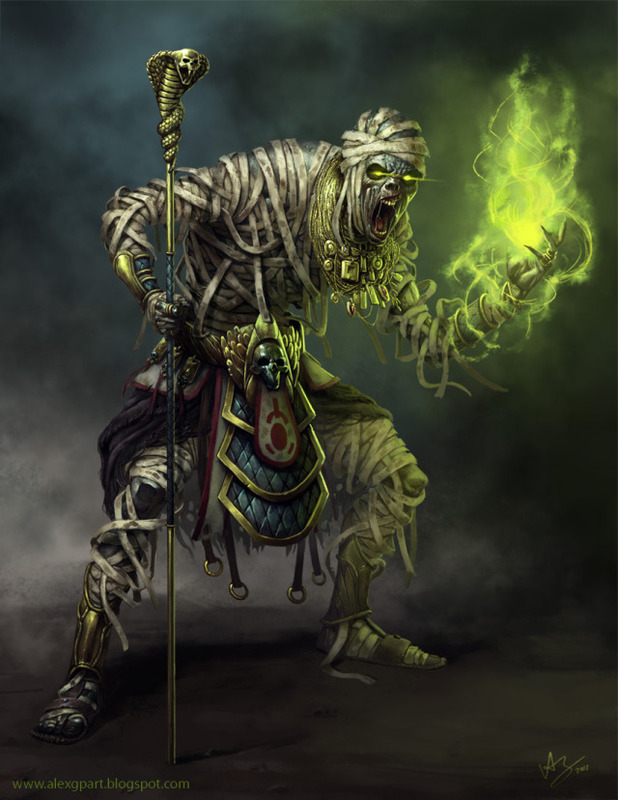 A colleague of the mummy sorcerer – a necromancer – had been nearby, marshalling troops and while invisible raised the dead as zombies to slow the adventurers down. This distracted them while a dozen mechanithrall prototypes (last encountered in their very first adventure) were sent to try and break their charge. These reanimated elf corpses, augmented by ancient giant steam-based technology cybernetics, poured out of a doorway in the north of the chamber. The necromancer then broke his invisibility to fire a lightning bolt at Quilynn and Darmon as Quilynn turned the newly created zombies. Darmon was able to roll into partial cover, but Quilynn wasn’t so lucky and took the full force of the spell. Badly hurt, she got behind the ziggurat to hide, and Darmon unleashed the last of his big offensive spells in retaliation, realising that he needed to shut this latest set of combatants down quickly. Enhanced by metamagic and a magical item that allowed him to maximise spell effects a limited number of times a day, he launched a searing fireball that vapourised most of the mechanithralls – and most importantly killed the necromancer outright. The mummy, meanwhile, was enduring in the face of many physical attacks, and only its inherent toughness meant that it lasted so long. In a desperate attempt to get away from Ruin, it managed to land a critical strike on him, which badly hurt him. As Ruin was the only person present immune to the mummy’s disease-ridden touch, everyone else was trying to keep at a distance, leaving the warforged druid to soak most of the undead horror’s assault. Eventually they managed to defeat the last of their opponents, and after some hasty discussions the adventurers pulled back to the forest outside to try and rest up. They were truly running on empty now.